The Long Version: The CLP stands for Cleaner, Lubricant, Preservative, and when you're dealing with steel this is the stuff you want for all those jobs. 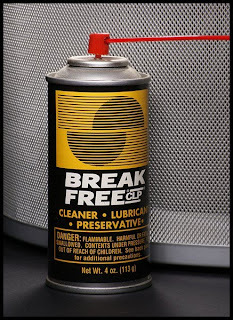 I graduated from 3-In-1 oil and WD40 when I first saw an ad for Break Free in some gun magazine or store, and have never looked back. It's more than just an oil, so 3-In-1 was replaced. WD40's main claim to fame is Water Displacement, hence the name. Break Free penetrates and frees rusty bolts (the Break Free part of the name) so that meant I no longer needed WD40, either. (And WD40 does NOT protect metals against rust, so people who spray their guns with it are often in for a nasty surprise). Break Free is what the US Navy used to clean the main guns on battleships. I use it for everything from gun care to preventing rust on my pipe snake, fixing sticky door locks, protecting & lubricating power tools and drill bits, and bicycle maintenance. It's safe on skin and even in your eyes, according to the can's label. 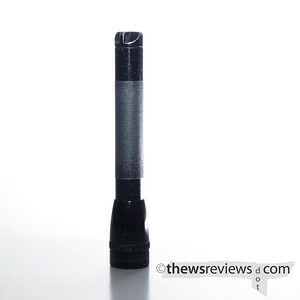 Comes in all sizes, from little 1oz bottles for your tackle box to 55 gallon drums for your battleship. Yeah, but: If Nike bought Korean Air, this is what the logo would look like. 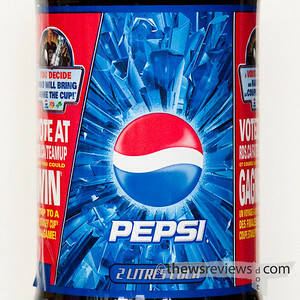 The Long Version: Like certain former spokespersons, Pepsi uses its massive resources to attract young people. As a result, they seem to spend as much time refreshing their company image as their customers; they've changed their logo substantially several times over the last twenty years, while Coke's has remained essentially the same since `85 - eighteen eighty-five. As a consumer, when I'm looking at a product I consider how many different designs exist to solve the same basic problem. When I see a lot of variety, it tells me that there's either a diverse range of needs that are being accommodated, and/or that none of them have really gotten them right. Think cellular telephones. When a market niche (note to Americans: that word does not rhyme with "itch") is dominated by a single design, I take that as a sign that it works. Think toilet plunger. Constantly changing one's corporate identity usually suggests that the company hasn't found one with lasting appeal, or that there is some other fundamental flaw in their market positioning. AT&T and ValuJet both come to mind. 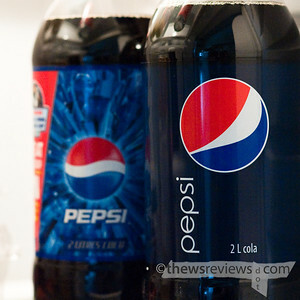 But Pepsi is unusual because constantly re-branding itself and re-introducing itself to the market is their actual strategy, as they strive to be up-to-the-moment and 'hip' in a way that only a multi-billion-dollar multinational company can be. They can always afford the coolest shoes. The problem is that approach - what my former boss would inadvertent call a "stragedy" - makes the right design a moving target. Even when they get a design that's perfectly in sync with the times, the times change. The old logo, with its ice-crystal background and oblique block typography was cutting edge once. 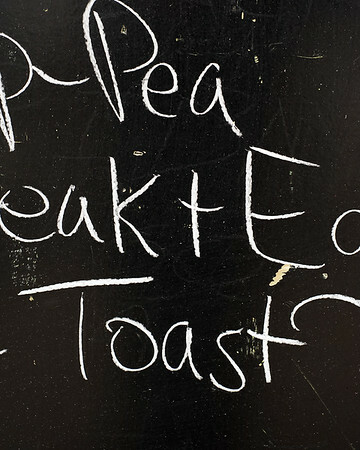 Changing a brand identity always involves a lot of work, a lot of controversy, and a lot of 'free' publicity. I already like the new logo better than the old one, and I said that last time, too. I'm sure I'll say it again in another five to fifteen years. But the most observant readers may have noticed a red can's reflection in the lead photo. 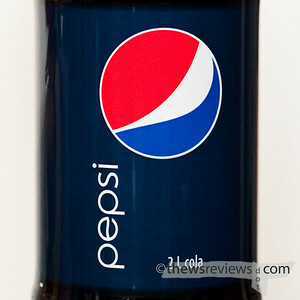 If you can identify the product, then you already have a powerfully succinct critique of the new Pepsi logo. Yeah, but: Don't rely on the numbers. 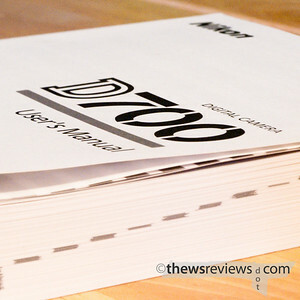 The Long Version: My experience with the D700, and my reasons for buying it, aren't exactly typical. My conclusions, after two weeks of using it, may also not suit everyone - but I also reserve the right to write a follow-up review after I've had more time with this camera. First of all, the D700 is a monster. The instruction manual is over 400 pages long - all in English - and the number of menu options and possible configurations is hard to wrap my head around. So it's entirely possible that the gripes that I have are solvable, and the camera and I will grow together and have a wonderful relationship. We're already getting along really well, but there's always an adjustment period. My previous camera - my other camera - is an Olympus E-3, and I've never shot with another brand. However, I work part-time in a camera store, and so I have passing and hands-on experience with nearly every DSLR on the market. I usually use the E-3 and E-1 with battery grips, so the size of the D700 is no big deal. I'd actually prefer the body of the D3, since it's smaller than a 'non-pro' body with a grip added to it. The build quality of the D700 is excellent, at least as good as the E-3, but I have to admit that neither fits my hand as well as the Canon 5DmkII does. After a great deal of thought, I tracked my preference down to the much more pronounced thumb ridge on the 5D body. 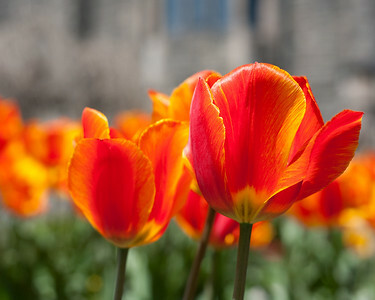 While the hand grip on the D700 is superior, both in shape and general grippyness, the camera's just not as easy to hold. This makes the most difference when I'm moving the camera up to shooting position; because I don't use neck straps I always have the camera in my hand, and have to move it through a longer range than most people. Another quibble that I have is that the D700, presumably like all Nikons, is backwards. The exposure compensation display has the positive EV on the left, and negative EV on the right. This is the opposite of Canon, Olympus, Panasonic, Sony, and Pentax. Nikon apparently knows this, and includes a menu option to reverse the indicators. But reversing the display leaves it at odds with the direction of the control wheel, creating a zigs-but-zags situation. Nikon fixes this with a menu option to reverse the direction of the control wheels, but it only reverses both of them. So to have the exposure compensation working correctly then the other control, typically aperture, ends up backwards. This is not a positive step, and makes a Nikon-Plus-Other system more difficult than it needs to be. The viewfinder on the D700 doesn't give 100% coverage. I'm used to fairly precise framing, but this doesn't bother me as much as I thought it would. The truth is that I often framed too tightly, so this gives me a little margin of error that I don't have to think about. The viewfinder itself is excellent, and while it's big, it's actually not as much bigger than the E-3 as its four-times-larger sensor would suggest. It has the option of displaying electronic gridlines, unlike the D3 and E-3 which need to be fitted with different focusing screens, but the grids in the D700's finder are rather sparse. Since they can be turned off when they're not needed, I wish Nikon had put in more of them. As it is it can be hard to have a line close enough, or long enough, to see if the camera's properly aligned. The Live View implementation on the D700 is more complicated than I had anticipated. If I set the drive mode to LV, then I need to press the shutter button to turn on the LCD. Press once more to take the photo, and then Live View helpfully turns itself off again. This is actually a decent way of working, since it lets me review the shot but doesn't overheat the sensor. I just need to remember to press twice on the shutter release, just like I would in the Mirror Lockup mode. But the D700 can be coaxed into behaving in different ways. The customizable buttons on the D700 can be configured to enable the Live View mode regardless of what the drive mode is set to. In this case, the camera behaves differently: the monitor stays active all the time, requiring only one press to take the photo. This is how the inventors of the technology made it work, and is a pretty sensible way of doing things. Nikon even takes it one step further, allowing this method of live view to be used with the Mirror Lock-Up mode, which goes back to the double-shutter-press but doesn't turn off the screen after the shot is taken. But with the LCD showing the pre-capture image, hitting the 'play' button brings up a brightness control on the monitor - there's no way to review my previous shot without pressing the customized button to turn Live View off. Adjusting the brightness of the monitor is insignificant compared to seeing the histogram, so it's an odd design choice and makes the camera clunky to work with in the studio. On the E-3, the Auto-ISO setting is part of the range of iso choices that can be selected: Auto, 100, 200, 400, and so on. To go from Auto to a specific value, all it takes is the same button press and dial turn that is used to change between any two specific settings. On the D700, Auto ISO needs to be set from within the menu, and while changing the numerical value settings with the ISO button is still possible, they don't seem to make any difference as long as auto-iso is enabled. I get around going menu-diving by setting up auto-iso to be the top item in the customizable My Menu, and then customize one of the function buttons to bring that option up. So with a mere three buttons I can enable and disable a basic picture-taking option. It shouldn't be this hard. Maybe it's me, and I just don't have the right settings, or there's something that I'm missing. It's entirely possible. 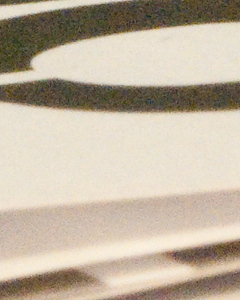 Did I mention that the manual is over 400 pages long? I said in the very beginning that my reason for buying the D700 isn't typical - I don't really care about, nor am I really impressed by, the D700's high-sensitivity image quality. It's astonishing, but it's not particularly important to how I work, and I certainly don't think that it's better enough to justify its price. Essentially I think that its low-light advantage is largely negated by the E-3' built-in image stabilization and greater depth of field. I'll get into more detail on that once I have more experience with it, and can run some comparisons with my E-3, and as always reserve the right to change my mind. I bought the D700 for its highlight latitude and the 85mm pc-e lens, whose macro and tilt-shift capabilities gives me something that Olympus - and Sony, and Pentax, and Canon - can't provide. 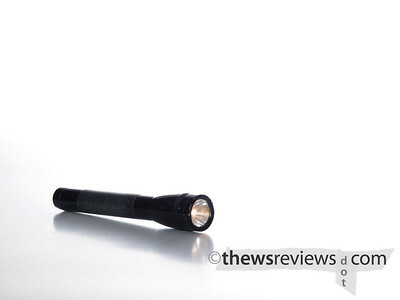 This set is an excellent combination for product photography, and coupled with the D700's ability to control two groups of speedlights from its built-in flash, there's nothing better for 1.7 times the money. Overall I have been very happy with the camera and the images it creates, despite my rather one-sided list of observations. The button arrangement is well done, controls are (usually) where I want them, and I'm learning my way around without too many problems. Some of the complexity is my own fault, since I'm also learning the Perspective Control lens and two other primes at the same time. And while the high-iso capabilities aren't that important to me, the flexibility of the low-iso files is vital and has been simply astonishing. Coming from my Olympus background, the ability to recover a shot that I expect to be cripplingly overexposed is a revelation. I have no doubt that this camera, and a small set prime lenses, will be doing most of my 'serious' work in the future. Yeah, but: It needs an expansion. 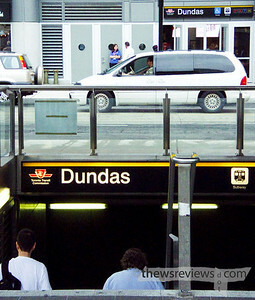 The Long Version: Dundas subway station is one of the classics. 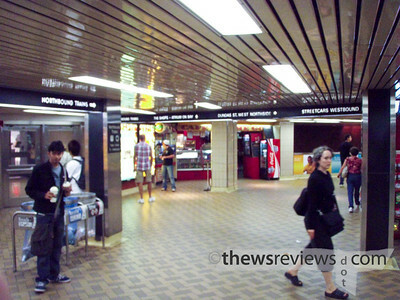 It feeds the Toronto Eaton Centre, Ryerson University (nee Polytechnic Institute), and an extremely popular stretch of Yonge street. 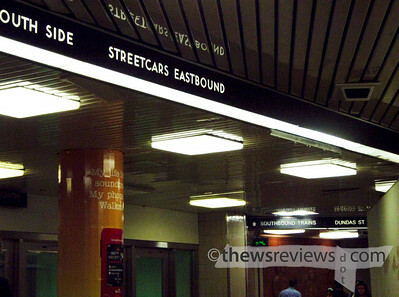 It's part of the original subway line, and has been in use for 55 years. It's unusual, if not unique, in that it's not possible to switch train platforms without leaving the fare-paid area. However, should you find yourself on the wrong platform, grab a transfer from the nearby machines before you switch sides, and explain nicely to the collector and they'll (probably) let you in. Both of the surface routes - the popular 505 Dundas Streetcar and the wallflower 97 Yonge bus - need a transfer from from somewhere else, so get one before you get there. Of course, the whole point of a subway station is to get somewhere else, and that's something that Dundas Station takes very seriously. There are six different ways to get out of the station. One to the southeast corner, opening into Dundas Square - the photo at the top. There's another exit to the new Toronto Life Square building. 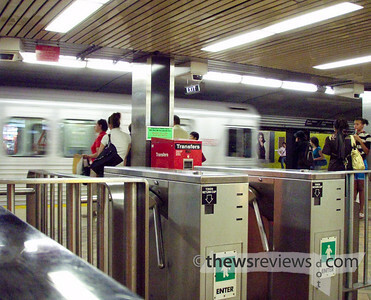 There are two exits to the Toronto Eaton Centre, one from the platform level and one from the underpass. Another exit leads to the Atrium On Bay on the north-west corner, and there's a street level exit on that corner as well. But the array of options isn't always a blessing. It makes the station extremely confusing for the uninitiated, and makes for different streams of people trying to get to different places when the trains let their passengers out. The station simply isn't big enough to handle the rush-hour crowds, and rush-hour seems to take up half the day. Unfortunately this is a common problem for the subway system, and there's no cheap or easy way out of it. A second exit at the North end of the platform, emerging somewhere around Edward or Gould streets, might relieve some of the pressure but it isn't where most people want to go. It would make my commute easier, but that's about it. 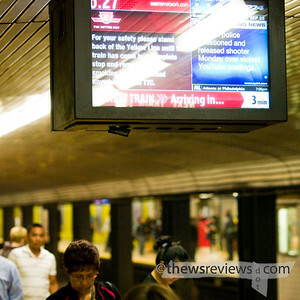 Dundas station was the first to introduce the next-train arrival information display. It's an interesting idea, but if you can see it, you're already stuck waiting for the next train and there's no way it's going to arrive any faster. If this was shown outside if the fare-paid area, then maybe it would provide some options. Perhaps next time. By a quirk of geography, I almost always arrive and depart from the Southbound platform. The few times that I go north I usually cross the street on the surface instead of taking the underpass. If it rains, I'll go in through the Atrium entrance instead of the narrow street-entrance stairs. Lots of options. All told it's a fun subway station to use - as long as it's not rush hour. The Long Version: No date yet, but we're thinking about Fall 2010. 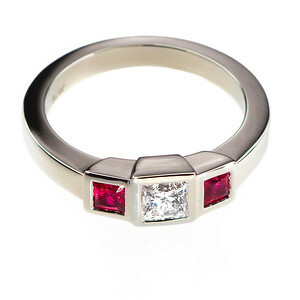 Ring design by Leif Benner. Yeah, but: Cheap and easy: bad in people, great in lenses. The Long Version: A few weeks ago I went on a bit of a rant about 50mm lenses, so I thought it would be fitting that I hurry my review of the Nikon 50/1.8. I've only owned anything Nikon for just a few days, so even though that makes me an expert in Ken Rockwell's world, this is really just a 'first impressions' review of the whole new-lens experience. I wasn't planning on buying the Nikon 50/1.8, or any 50mm lens, when I bought my new D700. It's not a focal length that I've ever used, as I prefer to be at a longer telephoto or just ridiculously wide. I've never really gone for the whole Rangefinder Mystique thing - even though I own a pair of old Yashicas with fixed 45mm f/1.7 lenses - and for me, 'street photography' means actually taking photos of the street. I really just bought the D700 to put it behind a Nikon 85mm PC-E Micro, and the 50/1.8 was a 'what the heck, it'll autofocus' impulse decision. The 50/1.8 is a bad lens. Or at least, it's really not a great one. It's soft wide open, soft in the corners until it's stopped down to f/umpteen, vignettes heavily to about f/4, the focus ring rotates, the DOF scale is useless, and the aperture ring is a vestigial flipper that serves no purpose except to give the lens a big "don't work" button. The instruction manual, should anyone actually read it, was probably last updated in 2005 - it mentions the F6 but also says that it will autofocus on all Nikon AF cameras except for the F3AF, so it predates the decision to not include a focus motor in the body of the D40/D40x/D60/D5000. If one of those is your camera, have a look for the twice-as-expensive af-s 35mm f/1.8 lenses that are just starting to emerge from the factories in China. But there's one compensating factor that overcomes all of my 'bad lens' concerns: this sucker is cheap. Really cheap. B&H, a benchmark American source, currently has it for $135, while the free-with-purchase 52mm lens cap costs $15 on its own. (Vistek, a moderately expensive Canadian retailer, sells the lens-with-cap for $160 and the cap-only for $13.) 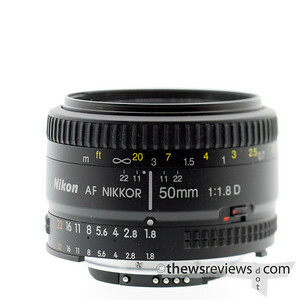 And Nikon lens caps are among the very best on the market: I bought them for my Olympus 14-54 and 50-200 lenses. Granted, the Nikon 50/1.8 comes with a cheap unbranded push-on tail cap instead of the more luxurious LF-1, but what do you expect for $135-$160? 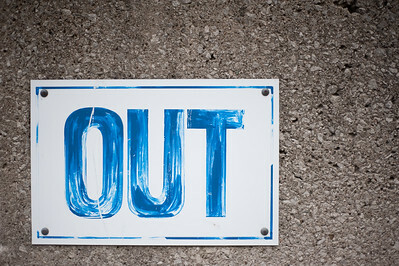 The first sample photo, "Out", was shot at f/1.8 and shows some pretty significant vignetting. I can see that I'm not quite square to the wall, so the corners are being affected by the short DOF as much as optical softness, but even the centre of the image doesn't have much snap. But who cares? At f/1.8, you're either desperate for light or shooting a portrait with fuzzy ears, so softness won't really matter. 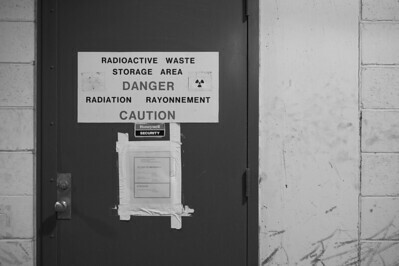 The second photo is at f/2.8, and the centre is better, vignetting is more mild, and the corners are less dreamy. The flowers are shot at f/4, and here the boke(h) is very nice and the sharpness is excellent. The near flower is actually at about the 1/3 point in the original frame, and I wouldn't hesitate to put critical subjects there. For less than twice what a cable release costs, there's not much to complain about here. I've spent years using some of the best lenses ever made for digital SLRs, and now I'm putting the second-cheapest Nikkor in front of the second-most demanding sensor in the Nikon lineup. This lens was never meant to cover a digital 135-format sensor, and it shows. For the first time, I'm having to deal with a lens that I have to think about. It's the exact opposite of the Olympus 50/2, which is so perfect that it actually gets a little boring - the Nikon has real character. So what if I can't just shoot wide open with critical detail in the corners any more? This 'nifty fifty' is cheap, small, and light. There's never going to be a reason to leave it at home. With an FX camera, it's a nice break from the monster glass and easy to justify owning even if it won't get used much. (It's also much better built and better looking than the Canon 50/1.8II, which looks dorky on anything that's not a Rebel.) For a DX camera with an AF motor, it's a substantial upgrade from the kit lenses, and can easily go on vacation alongside the 18-200 f/dark lenses of the world. My only hesitation would be for those with a camera that doesn't have a built-in AF motor, because their viewfinders are so bad that manual focus is practically impossible. On the other hand, it's still far cheaper than a lensbaby, and will give you similar-or-better results. So why not? You can probably even get them second-hand and save a few bucks. Someone once told me that photography can be fun even if it's not expensive. I still have my doubts, but I'm starting to see the possibilities. Yeah, but: Seriously, it costs how much? 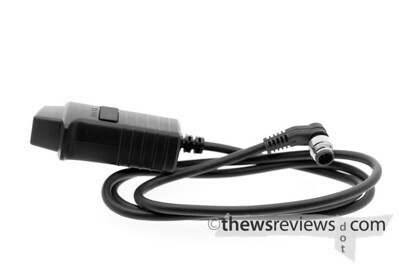 The Long Version: The Nikon MC-30 is an 80cm wire with a button on one end and a connector on the other. When the button is partially depressed it sends one kind of signal, when it's fully depressed it sends another, and there's a lock to keep the contact closed. The slim amount of power needed for the signal comes from the camera it's connected to. 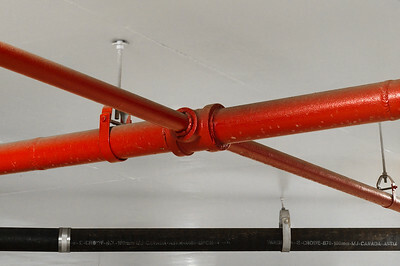 It works reliably and smoothly. 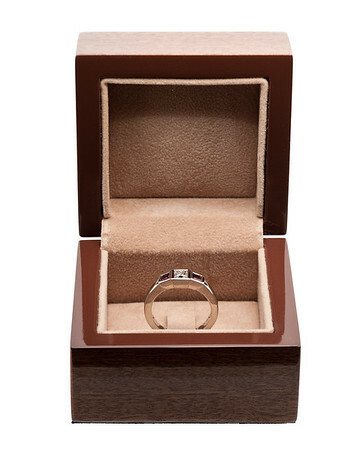 For $14.95, it would be just about perfect. And in a perfect world, it would cost about fifteen bucks. For those who haven't seen the actual price of this device, I won't spoil the surprise. Let's just say that we live in a very imperfect world. For some reason, wired remotes are invariably expensive, and the Nikon one doesn't break the trend. A cable release is what you need to make all of the rest of the tripod-related expense and hassles worthwhile. In fact, I'd wager that a decent tripod and a cable release will outperform a tripod that costs significantly more but isn't used with a remote shutter release. So in a way, the Nikon wired remote (and all of its original-manufacturer brethren) are a cheap way to improve your photographs. But by comparing it to the vastly more complicated electronics that you can buy for less money - toasters, alarm clocks, DVD players - it's completely out of alignment with the universe. The MC-30 cable release will probably last forever and is made in Japan, but considering what it costs I have a hard time endorsing it as a general purchase, no matter how useful it can be. Long-time readers of this blog may notice that this is the first time I've reviewed anything from Nikon, and wonder why I'm not writing up the almost-as-expensive Olympus RM-CB1 instead. That might be a really good question.